Your kids may be off for the summer, but that doesn’t mean you are – vacation days from work can be difficult to come by. Also, unfortunately, summer vacations can be pricey. The costs for airfare or gas, lodging, admission tickets, meals, etc., add up. A great solution that doesn’t require much vacation time or cost is a summer day activity. You and your family can take budget- and time-friendly adventures that are enjoyable, interesting, and still provide great family time together. 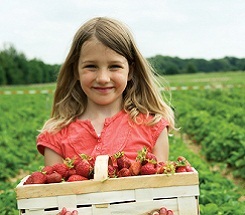 I have special memories of being a kid and going with my parents to local farms to pick fruit. My mom would pack a picnic, as well as damp towels in plastic bags so that we could clean and immediately eat some of the fresh fruit right on the spot. The summer months are particularly great for fruitpicking since there’s usually a plethora of delicious fruit (depending on your location): peaches, nectarines, raspberries, boysenberries, cherries, apricots, etc. Some farms also specialize in herbs or lavender, which is fun and fragrant to pick as well. In addition, these rural venues often feature kid- and family-friendly activities, such as music, crafts and carriage rides. Taking a train ride for a daytrip adventure makes an excursion particularly special. You can decide with your child where you want to visit, pack a few snacks and other necessities for the day, and you’re off. Amtrak usually offers ticket specials during the summer months, so traveling by train can even be less expensive (and stressful, tiring) than driving by car. While train-riding, you and your child can enjoy the scenery as it travels through various destinations, and in the meantime, you both can read books, play cards and games and even grab a bite from the train café. A visit to a local waterpark usually means all-day summer fun for your kids, as well as relief from the heat. There are commercial local parks that have the huge, crazy slides but the admissions can be pricey, especially if there are many of you and you are restricted from bringing in outside food. Alternatives are public water parks run by city parks and recreation departments. We’ve discovered one waterpark that’s about 20 miles from our house that has inexpensive admission prices and you can also bring in your own food. Although they don’t usually have the numerous, large waterslides available, public waterparks are still a lot of fun and may have a playground pool with small slides and a play structure, plus a big slide and diving boards. Summer festivals are always a good time. Check your local event calendar listings to see what festival events are happening in your area during the summer months. You can spend the whole day at one — enjoying festival food (think funnel cakes), possibly rides, crafts, parades and music. There are usually a range of festivals happening during the summertime, such as storytelling, fruit-themed festivals, art and music. Although I’ve lived in the same city for years and years, I’m embarrassed to say there are so many interesting local sites, museums and parks that we’ve never visited. So you usually don’t have to travel far at all to feel like you’re “away” and even as if you and your kids are like tourists on vacation. You can possibly supplement these visits with a fun scavenger hunt; put together some clues at various locations and your kids will enjoy searching for them to get to the ultimate treasure. No matter what the plan is, whether it be a visit to a local zoo, museum, park or even a day of water balloons and Slip ‘n’ Slide in the backyard, your kids will likely just be happy to hang out with the family. Summer days are perfect for that!